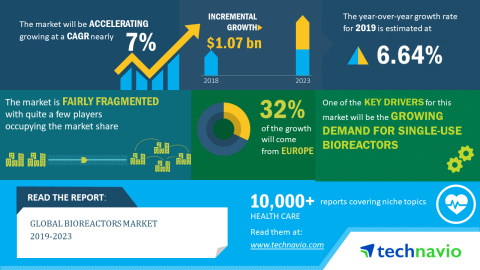 Technavio has announced the release of their research report on the global bioreactors market for the forecast period 2019-2023. This bioreactors market analysis report segments the market by end-users (biopharmaceutical companies, research institutes, and contract research organizations) and geography (Asia, Europe, North America, and ROW). There is a growing demand for single-use bioreactors as these bioreactors are easy to use when compared to stainless steel bioreactors. The primary reason being single-use bioreactors can be set up much more smoothly for continuous processing. A single-use bioreactor used in a fed-batch manufacturing process can be converted to fit the requirements of a continuous processing operation. Customization can only be conducted on the process-specific consumable parts; the vessel stays the same irrespective of the process mode. In the case of stainless-steel bioreactor, a similar change would lead to an extensive revamp of the entire infrastructure of the facility which would result in additional investments. The steady growth of the bioreactors market has enabled emerging start-ups to make use of bioreactor technology for the development of advanced medical procedures. For instance, companies are seen developing bioreactors that are capable of performing a chemical bath for a piece of human tissue for three weeks. High metabolism and weight loss are being observed when the tissue is reinserted into the body after the chemical bath process. After processing, the tissues are sent back to the end-user company's office to be worked in a bioreactor. Similarly, other players are also in the process of developing bioreactors at a low-cost and provide an open solutio for end-users. The demand for bioreactors is expected to increase, as such procedures help in treating people suffering from obesity. "Pharmaceutical companies in Europe are constantly making efforts to plan and adopt the quality by design approach in their manufacturing processes as the European region is expected to register the highest incremental growth during the forecast period. Moreover, several organizations are seen providing information for testing and aid in analyzing the laboratory community and further assisting in infrastructural support to facilitate efficient scientific and technical cooperation among European member countries. Such factors are augmenting the use of bioreactors," says an analyst at Technavio. To increase their bioreactors market share, manufacturers are focusing on collaborating with other players in the market. GE Healthcare has collaborated with Jacobs Engineering Group to develop the Pfizer's USD 350 million monoclonal antibody manufacturing center in China. Jacobs Engineering Group has also been involved with other biomanufacturing facilities such as Merck KGaA, Novartis, and Bristol-Myers Squibb.